Rapha�l Ari� (1920-1988) was never as well known as his two great compatriots Nicolai Ghiaurov and Boris Christoff but he is the third in the trinity of great Bulgarian basses. Born in Sofia he studied with the important pedagogue Christo Brambarov who guided his pupil�s career with care and caution. He won the Geneva singing competition in 1946, continuing studies in Italy with stellar figures such as Stracciari and Granforte and soon made a name for himself in Prokofiev, in Boris and Don Giovanni. He performed widely in Italy and France in particular � though in 1953 he was chosen as the Commendatore for a Salzburg Festival performance under Furtw�ngler � even if he made Rome his base. 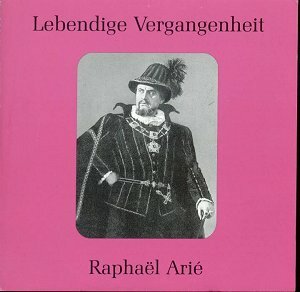 His successes in the Italian repertoire were many, his forays into German opera (much less lieder), few. The trajectory of his career might indicate a certain stalling � a lack of Vienna, Met, Covent Garden performances, a desire to sing in houses closer to home. But the truth is that Ari� was a considerable artist whose relative lack of charismatic vocalising perhaps prevented him from reaching the topmost echelons of international houses. His Rossini immediately discloses a voice of refined imagination. It�s elegant, forwardly produced, well sustained, even of tone and lacking melodramatic flourish. It was certainly a voice with presence, lest one mistakes refinement for reluctance to engage � his Bellini is impressively characterised, fully rolled �r�s� whilst his Verdi reinforces, with the beauty of his line, his bel canto lineage. The extract from Ernani may not be the most sulphurous or incendiary but it is beautifully done. One can compare the elegance and precision he habitually displayed with the rather hell for leather untidiness of the tenor Tomaso Spataru in their duet from Gounod�s Faust. If one measures his Boris (and by implication his Glinka) with Christoff or even Chaliapin of course, one finds him lacking in histrionic projection � but there�s no lack of commensurate sonorous directness. Certainly the lurid dramas enacted by others was not Ari�s way � as one can plainly note in Boris� Farewell scene. He triumphs rather in the lyricism of Anton Rubinstein or in the full warmth he brings to Eugene Onegin. There, one feels, he is intimately at home. His recordings here date from 1947 to 1953 and were all made for Decca. They sound excellent here and do justice both to his voice and the original engineering.